GreenClean is not a bacteria based product. It is a hydrogen-peroxide powder base that activates when it hits a wet surface. Finally, a Worry-Free Algaecide that Works Instantly on Even your Toughest Algae. Unlike other aquatic algaecides on the market today, GreenClean works on contact to control algae (especially String Algae) in water gardens, ormanental ponds, fountains and other water features. It is activated by water and safe for all animals once it is in liquid form. GreenClean does not harm fish and aquatic life and starts working instantly. GreenClean immediately begins fighting algae blooms, releasing vital oxygen into the water as it biodegrades. SAFE for Koi and other pond fish and Aquatic Plants. It is recommended that you rinse it off the plant leaves to avoid potential burning. GreenClean a non-copper, organic based algaecide that works on contact to eliminate string algae and green water. Can be used in water containing live fish and plants, including Koi and other sensitive fish. NOTE: It is not for use with scale-less fish and can damage their outer skin if direct contact with the product is made.Take care not to sprinkle the product on these types of fish during treatment. Consumption of these fish after an application will cause no ill effects to other fish or humans. GreenClean is a multi-purpose granular algaecide formulated to kill algae, scum and molds on contact. It works through a powerful oxidation reaction and can be used in ponds for algae control as well as on floor surfaces (concrete, gravel or dirt) . 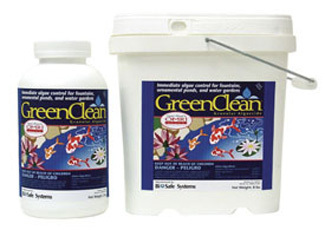 GreenClean is also labeled as an aquatic algaecide. maintaining clear, algae-free ponds is not only important for aesthetics, but for disease control if the pond is used for irrigation. No special permits are necessary for the use of this product! GreenClean's Hydrogen Dioxide chemistry is extremely effective for the treatment and prevention of algae in ponds, streams, irrigation systems, ornamental pools and fountains. GreenClean will not affect or discolor concrete or synthetic liners. GreenClean does not harm fish or aquatic life. For more techical information and the MSDS Sheet "Click This Link"
See Videos @ bottom of this page. Q: Is GreenClean Home & Garden harmful to my fish? A: GreenClean Granular & Tablets can be applied to areas that contain aquatic life, fish and plants and can be applied to areas used by or in contact with humans, animals, horses, livestock, pets, birds or wildlife. A: GreenClean Tablets work best on a weekly basis as part of a preventative algae program. Q: Has GreenClean been EPA registered? From Arvey of Sunnyvale, California on 8/17/2011 . From Diane B of Woodbridge, Connecticut on 8/16/2008 . From Brooke of Bakersfield, California on 11/29/2007 . 6/12/2015 – Is GreenClean Organic Algae Control safe for pets. I have a dog that likes to swim in my pond and drink the water. Will . . .
6/4/2013 – Can I use one tablet in a 50 gal. water feature with 3 gold fish. I understand the application is one tablet per 200 gal. . . .
6/4/2013 – does Green Clean organic TABLETS work @ high temperatures-105 to 115 degrees? Thank you.